In order to understand futures trading, you should know what derivatives trading is. Derivatives are financial contracts that derive their value from the price movement of another financial item. The price of a derivative tracks the price of another (i.e. underlying) from which it gets its value. Derivatives are financial contracts that derive their value from the price movement of another financial item. Futures are primarily used for hedging commodity price-fluctuation risks or for taking advantage of price movements. When such a contract is initiated, the investor need not pay the full amount for a contract, only a small upfront payment is required. Futures contract is one such financial instrument wherein a contract or agreement is formed between a buyer (the one with the long position) and seller (the one with the short position) and the buyer agrees to purchase a derivative or index at a specified time in the future for a fixed price. As time passes, the contract’s price changes relative to the fixed price at which the trade was done and this creates profit or loss for the trader. Every contract is monitored by the stock exchanges who settle this trade and stock exchanges. How do you trade a futures contract? Futures are primarily used for hedging commodity price-fluctuation risks or for taking advantage of price movements rather than buying or selling of the actual cash commodity which is done with a stock. Futures contracts are available on four different assets – Stocks, Indices, Currency pairs and Commodities. There are two primary participants in futures trading – the Hedgers and Speculators. Hedgers use futures for protection against irrational or rapid future price movements in the underlying cash commodity. Hedgers are usually businesses, or individuals, who at one point or another deal in the underlying cash commodity. Let’s take for instance, a major food processor who cans corn. If corn prices go up. he must pay the farmer or corn dealer more. For protection against higher corn prices, the processor can “hedge” his risk exposure by buying enough corn futures contracts to cover the amount of corn he expects to buy. Since cash and futures prices do tend to move in a parallel direction, the futures position will profit if corn prices rise enough to offset cash corn losses. Firstly, the value of futures depends on that of another derivative, so it has no inherent value in itself. The contract lasts only for a particular time period and has an expiration date, unlike other financial instruments. When you buy a stock, it represents equity in a company and can be held for a long time, whereas futures contracts have a fixed time period. This is why the market direction and timing are vital while considering futures trading. Perhaps the most important difference between futures trading and other financial instruments would be in the use of leverage. So we know that futures trading is a contract for investing in a derivative. When such a contract is initiated, the investor need not pay the full amount for a contract, only a small upfront payment is required. It’s an initial margin of the total value that is required to initiate the contract. The margin and maintenance value are set by the exchanges. This is one of the most important aspects that distinguish futures market from other financial instruments. A commodity is a physical product, whose value is determined primarily by the forces of supply and demand. This includes grains, energy, and precious metals (the most popular one you’re likely to recognize being Gold). Commodities trade in a centralized market, where investors and speculators predict if prices will rise or fall by a predetermined time. In order to save the trouble of the traditional method of calling a commodity broker and waiting for a filled order price, trading commodities online is more efficient when done with some prior thorough homework and preparation. The first step is choosing a commodity broker– There are several brokers who offer online trading with quality product and service and low commission rates. The next step involves finishing the paperwork for the online trading account. The broker analyzes the client about whether he/she is suited to trade commodities. Information on the client’s income, net worth and creditworthiness are collected. Funding the account– It is up to the individual to decide the amount of funding for the account. Many commodity brokers offer simulations to practice before you involve actual money. Futures Trading is a complicated area because there are so many derivatives involved and it also involves high leverage so much so that in one shot you can lose a lot of your money. Thus it is important to understand the internal workings of these basic areas. 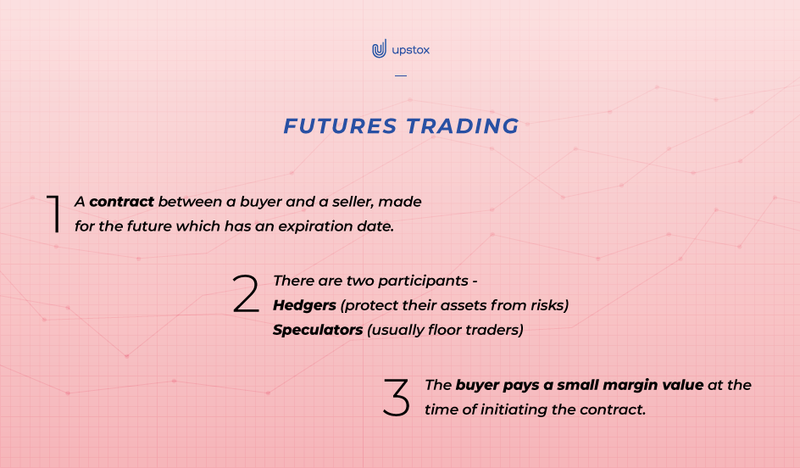 Futures trading is a contract between a buyer looking to invest and a seller and where the contract is made for the future and has an expiration date. There are two participants- Hedgers and Speculators. Hedgers protect their assets from risks and speculators are usually floor traders. Futures trading have no inherent value and are compared with the value of other underlying assets. One important aspect is leverage. The buyer only pays a small margin value at the time of initiating the contract. It is possible to trade commodities online with prior preparations. Finding a good broker is important. TradeStation, Option Express, and Interactive brokers are some examples.